Jane Cox has reconstructed the feudal story of Box in a totally original and fascinating way by depicting what the monks at Farleigh Abbey might have written at that time. We are sure you will enjoy this modern take on Box’s past and learn a great deal about life in Box at that time. The history of Box was dramatically altered in the early Norman period when the area developed in ways completely different to its Saxon past. From childhood, we all know stories about the noblemen and barons, the Battle of Hastings, William the Conqueror and King John. But details of Box village are much more difficult to understand because the Normans introduced concepts of homage, fealty and feudal tenure, which are no longer relevant for modern readers. I write from the Priory of the blessed Mary Magdalene at Farleigh where we brothers seek to do the Lord’s Will. Magna Carta has been signed by King John and his knights. What a milestone in our history! I feel compelled to write because one of the 25 Surety Signatories to Magna Carta is our own Lord of Box, Henry de Bohun, Earl of Hereford. He’s the first Earl of the family and his part in Magna Carta is a holy miracle because of the dreadful quarrel he has had with the King. Two years ago the King laid a hefty tax increase on his Barons to finance a second French campaign to retrieve the Norman lands lost in 1204. The Barons revolted and our Earl Henry took an active part in it and what trouble it brought him, his lands being seized and himself out of royal favour. Praise God and blessed Mother Mary that the King became reconciled with his Barons and Magna Carta was signed. My Lord has his land back, albeit the experience has left its mark. King John, ever called Lackland and ever resentful because his father gave land to all his brothers except him, considers his Barons should be thankful for their birthright and pay up any taxes asked by their King. Contemporary view of twelfth century monk's conduit at Monkton Farleigh. 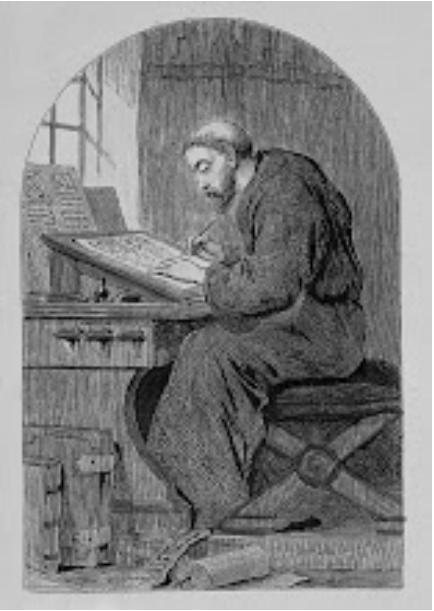 I would not be writing now without the generous giving to religious houses by generations of the de Bohun family. In 1120 King Henry 1 gave the lordship of Box to Humphrey de Bohun for his loyalty and service. This was the year of the White Ship Disaster when all souls drowned in the channel, including King Henry’s eldest son, heir to the Throne. After Humphrey died in 1123, it was the next Humphrey who became like a son to the grieving King. He, with his mother, founded our Priory in 1125 and gave us all Box revenues, present and future. A Charter of 1144 detailed these gifts as the land which we till and the mill where we grind our corn to this day. Like all religious houses which benefit, we pray for their immortal souls in our Daily Offices. Earl Henry has carried on the family tradition and his protection of our Priory was proven when as our patron, he was not consulted when our Prior Walter Parvus was removed by our Mother Priory. We monks agreed among ourselves that Walter should go but supported Earl Henry’s rights in this matter, a principle if you like. His case was upheld giving our Priory a precious independence. Of course Earl Henry soon realised that poor Walter, restored to office, was no more suited for the position than he had ever been and got rid of him. Our Overlord of Box being an Earl and having such a prime role in Magna Carta makes us brothers feel better about the omission of Box from the Domesday Book. Why did Ditteridge have an entry? Why did Hazelbury have four entries? I shall write of Hazelbury and Ditteridge the lords later, but to omit Box was to overlook its worth. We know Box has only a few farmers, workers and quarrymen living in modest dwellings just as it was at Domesday, but what riches of pasture and ready springs of water abound to delight any Lord and King! Until now, no lord has lived here although the rents have been collected promptly. 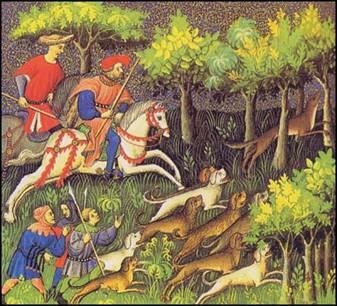 As we walk to Box over the King’s Down, we imagine we see King John and his knights in the chase. Box is full of God’s beauty and special to us and should have been in Domesday, whatever its size. The Lord of Box, under Overlord Earl Henry, is Sir Bartholomew Le Bigod who has not been party to Magna Carta, but he is a knight and when not in battle, lives a quiet life with Lady Beatrice at The Hall. We rejoice to see him living here! Norman charters gifting religious houses name his father William, his uncle Radulfus and his grandfather Alvred. Radulfus Bigod was here in Box digging a ditch to ease the path of stone down the hill from Hazelbury Quarry, but he didn’t finish the job and only The Lord knows what happened to stop him. The early Lords of Box were Sanson Bigod and his namesake, an older Bartholomew. The Bigods came here as knights of the de Bohuns, as they were in Normandy. Bartholomew le Bigod was a blessed donor of land and a mill in Box to our Priory in our early days. This mill was built by the Romans, part of their great villa in Box and it is the stone of that villa, left lying in piles after it was sacked, that the Earls of Hereford used to build the Church in Box. The Church is called St Peter’s by some, we brothers call it St Mary’s, like our Priory, and pilgrims crossing our valley from the Fosse Way to Canterbury ask to hear our offices in the Thomas Chapel. They journey to be with the bones of Thomas Becket, murdered most foully and now a Saint. Here’s Box Church with three names, one of which will be settled by God’s will. Lord of Hazelbury is Henry Croc, listed as present at the Magna Carta signing, but not a Surety Baron like my Lord Henry de Bohun. His inheritance started with his ancestor Reginald Cnut, also known as Rainald Croc, lord of the biggest land allocation in Hazelbury’s 4 entries in the Domesday Book. Reginald was Lord under Tenant-in-Chief, Miles Crispin, whose wife Maud was heiress to Hazelbury in the Honour of Wallingford. It’s all about the stone of course and everyone is after a share. Miles and Mauds’ daughter, also called Maud, married Brien fitzCount, but the family line was extinguished with the deaths of their young sons of leprosy. I pray for their souls and for the souls of poor Brien and Maud, both in religious houses at the end. The Crocs were then lords of Hazelbury under Henry II but living at Cannock Chase, inherited by Maud, wife of William Croke I, from her father Richard the Forester. In 1189, an heir with a better claim to Cannock than Richard, brought the Crocs to Hazelbury. There’s talk of them building a great house, but no sign of it yet and they’ve got all that stone! Perhaps it will run out as they keep gifting quarry rights. Those Black Brothers at Stanley Abbey have already been given most of the quarry. Bradenstoke Priory has always had stone too but our Priory has never been given quarry rights. Now we have seen Walter Campedene taking stone and it’s not for Bradenstoke as you’d think, he being an Augustinan deacon, but for himself and we find out he’s got land in Box too. Perhaps Sir Sampson gave it to him, cousin to cousin. I must be even handed. Our Priory has had generous gifts from the Crocs and Bigods, just no stone. There are lesser lordships in Hazelbury as well. The Domesday allocation to Nigel, King William's doctor, seems to have disappeared. 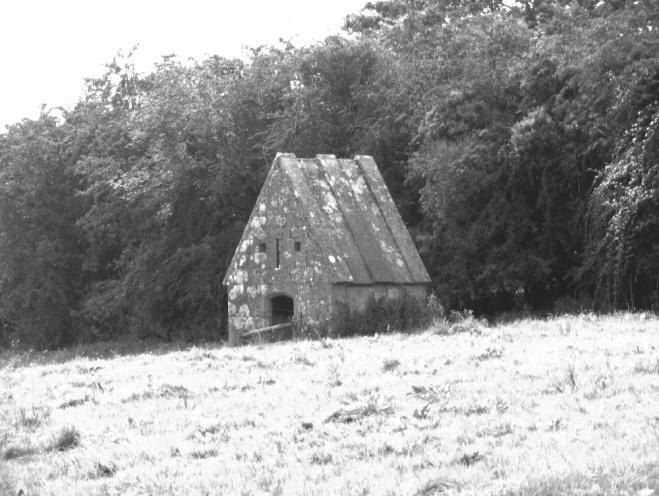 The Bishop of Exeter continues to receive rent from the fields bordering Hazelbury Quarry where St David’s Chapel has stood since Saxon times. 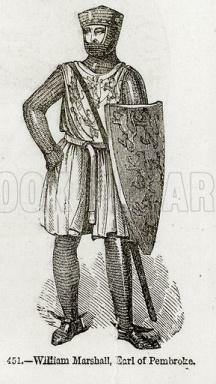 Cypping, a Saxon Lord kept on after the Conquest, had land and a farm at Henley. Today Ralph Cupping, surely his descendant, is Lord of Henley. Ralph has granted his land rents to our Priory so we pray for his immortal soul in our Daily Offices. Our Priory really doesn’t have much to do with Hazelbury. We know more of Ditteridge which we see from the King’s Down, walking the meadows to Box. There it lies across the Bybrook from the fields we till. It has been a favoured place to settle from ancient days. And now I must mention The Great Disgrace, as the person disgraced was Count William d'Eu, Tenant-in-Chief of Ditteridge and over 70 other places, only given to him because his father Robert was the King’s best friend and ally. That wretched man plotted against Kings William and William Rufus, trying to oust them from their thrones in favour of Stephen of Aumale, William the Conqueror’s nephew. Found guilty of Treason in 1095, he was blinded and castrated and died in Salisbury Jail. Praise the Lord his father died before this sorry affair. King William Rufus took over his lands, putting in his own man as custodian, Gilbert fitzRichard de Clare. The Lord will determine the outcome of Magna Carta and I give thanks to have witnessed its passage. Now I see my thoughts and words charge me with the sins of pride and envy. Mea Culpa. I will do penance. Amen. Jane has undertaken a massive amount of research into life in feudal Box in preparation for her forthcoming book on the subject of the Bigods and Bohuns. She is well-known for writing and directing the decennial St Thomas à Becket play and we are privileged to be able to publish her latest article.